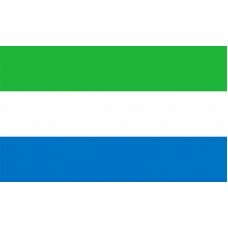 The Sierra Leone Flag features three horizontal bands in the colors of green, white and blue. 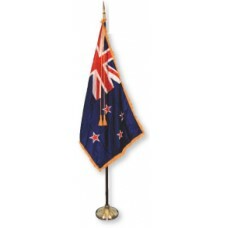 The green color represents the country's natural resources, which include its agriculture and the mountains. The white color represents peace and justice and the blue color represents the harbor of Freetown and the country’s hope for world peace. 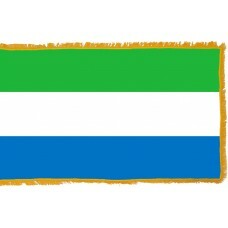 The Sierra Leone Flag was adopted on April 27th, 1961, the same year in which it became an independent country. Sierra Leone, which is often referred to as "Salone" is a small country in West Africa that shares borders with Guinea, Liberia and the Atlantic Ocean. Its capital city is known as Freetown and is next to the Sierra Leone harbor, which is the third largest natural harbor in the world. Sierra Leone is made up of five administrative regions, which are, The Northern Province, North Western Province, Eastern Province, Southern Province, and Western Area. It is one of the smallest countries in Western Africa and is also known as the "Little Jewel in West Africa." Sierra Leone is a country that has been inhabited for around 2,500 years. It was discovered in 1462 by the Portuguese explorer, Pedro de Sintra. He gave the country the name "Serra Leon" which translates as "Lioness Mountain" due to the formation of them. Following the discovery of Sierra Leone, Portuguese traders soon began to arrive and the harbor in Freetown, as well as other Europeans, including the Dutch and the French. The Europeans set up trade here and it became the main base for all the countries trading slaves. In 1787, following the American Revolutionary War, the British found a settlement, known as "Province of Freedom." 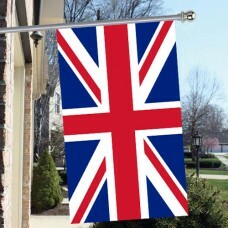 It was used to home some of the "Black Poor of London," who were African-American slaves that the British had managed to free during the war. In 1807, Sierra Leone became a British colony as the British made the slave trade illegal. Sierra Leone remained a British colony until it gained independence in 1961. Sierra Leone's economy is mainly reliant on mining, especially diamonds. On February 14th, 1972, the world's third biggest diamond was discovered in Sierra Leone and is known as the "Star of Sierra Leone." The country is also a major producer of gold. Tourism is an industry that is gradually growing as the country does boast some of the most beautiful beaches in the world and is also visited for its mountains. The two islands that are popular and visited often are the Banana Islands and Turtle Island. The Banana Islands are made up of three islands, which are, Dublin, Ricketts, and Mes-Meheux. The island of Mes-Meheux is uninhabited and the island of Dublin is home to the best beaches, while the island of Ricketts is home to the best forests. The Banana Islands are only reachable by boat, ferry, or helicopter.